The MSA ALTAIR 5X Detector is a durable, providing world-class impact resistance. 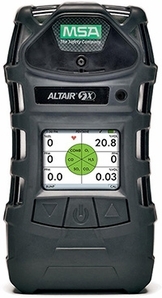 The ALTAIR 5X portable Gas Monitor allows for industry-first LEL, O2, CO, H2S, and SO2 60-second span calibration and 10-second bump test time. Equipped with Integral pump,the Altair 5X gas detector with recessed inlet provides improved durability with fewer snag hazards. MSA Altair 5X Multigas Portable Monitors offer cost savings of more than 50% on calibration gas, replacement sensors and maintenance. Typical decrease in downtime of more than 50% while bump testing the instrument, waiting for gas response and waiting for the instrument to clear. Enhanced safety with industry-leading accuracy, repeatability and response times. Order Information: MSA 10116926 Altair 5X Gas Detector features LEL, O2, CO and H2S sensors with monochrome display, integral pump, 10 ft sampling line, 1 ft probe.